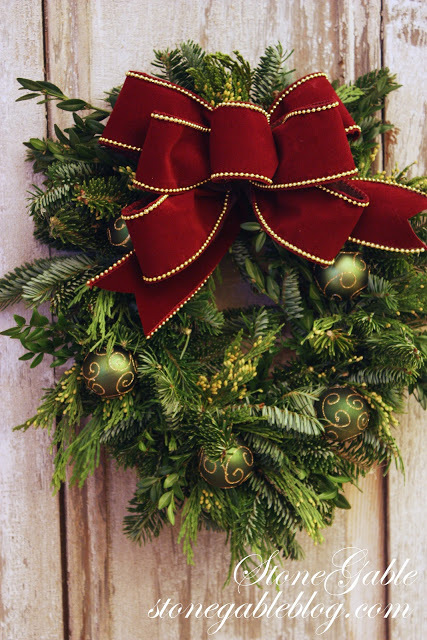 Bows are like lipstick on a wreath… they make them look bright and prettier! 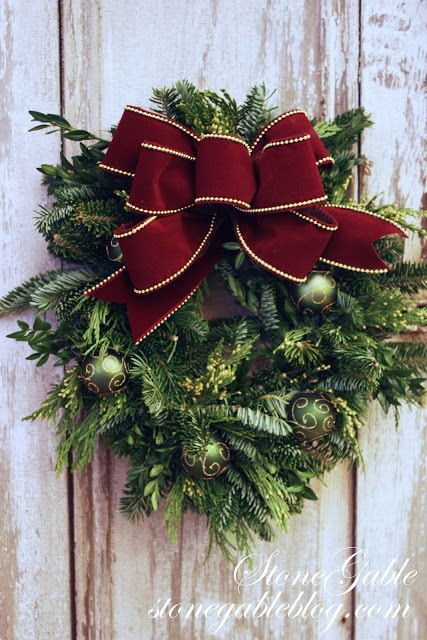 This prim and proper bow finds it’s way onto wreaths and Christmas presents around StoneGable. It’s sorta my signature bow!!! 4. Do the TWIST… make a small loop with the ribbon and twist the end of the loop so the right side of the fabric is facing up. You will be doing the TWIST often for this bow. This is an important, easy technique to learn. Hold the TWISTS together between your thumb and pointer finger. 7. Do the TWIST and hold together. 9. Make two longer side loops by following directions # 6 and 7. Now you have a center loop and two pairs of side loops. If you want a third pair of loops repeat directions #6 and 7 again. Make sure to make each loop just a little longer than the last set of bow loops. 11 . Slip a wire through the center loop and catch all the ribbon you are pinching together. Secure by twisting the wire tightly around the ribbon. 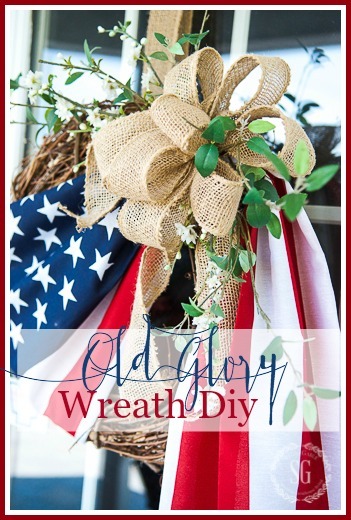 Wire to a wreath or package. Fluff! 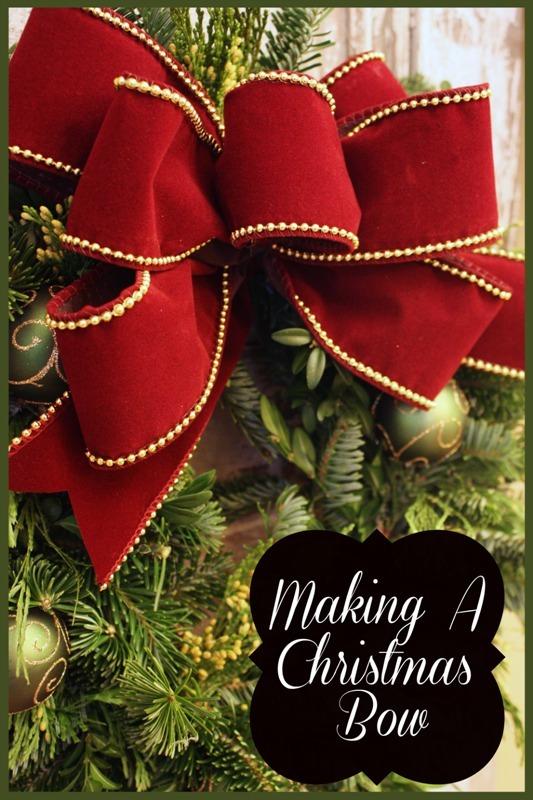 Here is a triple Christmas Bow I made for the wreath on my front door. 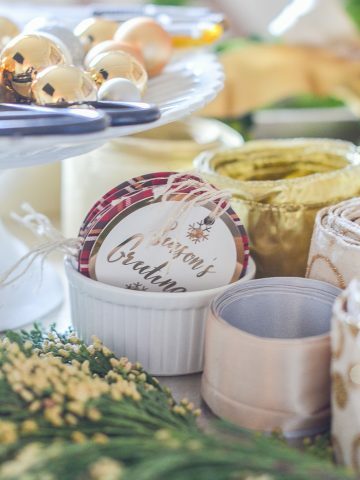 Use the same directions… put one ribbon on top of the other. I wake up every morning, read my devotions, then look for your blog! You are such an inspiration! I love new ideas, creative, helpful and different! Thank you so much. Now, I am ready for work, but look forward to returning home to create a pinecone ornament! Danke für die wunderschönen Schleifen! Thank you for helping us learn to make a bow. I would also like to request you make a video making your bow. I would love it. Thank you and I hope you and your family have a wonderful Christmas. Such an easy to follow tutorial, great. 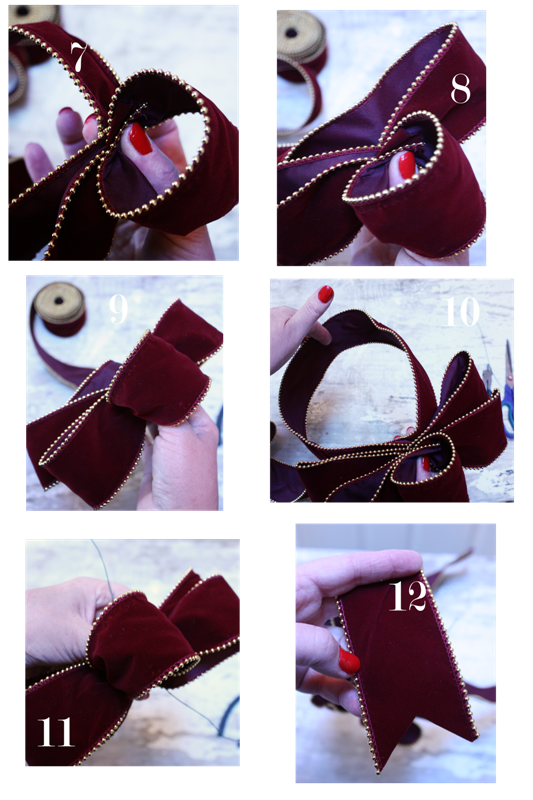 I’ve pinned your bow tutorial and will certainly be trying it! I don’t know why but I just never quite mastered bow making! This should help! Thank you. Thanks for the tutorial! I used to know how but forgot. This makes a lovely bow. You are a gifted teacher. Thank you. I’m going to give this bow a try. I LOVE your bows!!!! They are so pretty! I really enjoy your tutorials on how to make them. Thanks for sharing! Merry Christmas! The twist is what gets me! 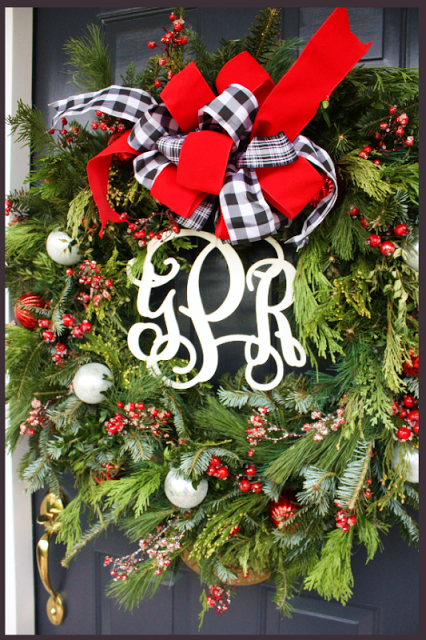 Love the bow on your wreath, and adding layers with a variety of materials to add texture and interest! Good job! When I study your posts I attempt to put together the floorplan of your lovely home. I sense a spacious, welcoming family home. Would you be so kind as to share a bit of info with others. Thank you for this wonderful tutorial. 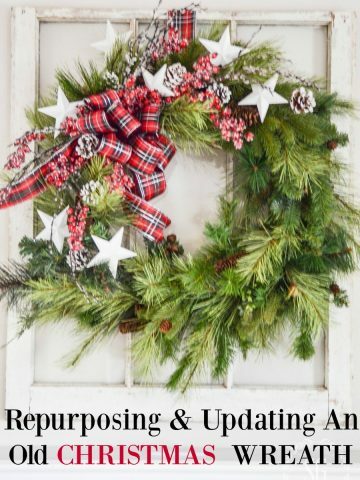 I am making wreaths for my home and the bows have always given me trouble. No more your instructions are very clear. Thank you, thank you, thank you! I have never been able to make bows that don’t end up looking like my kids made them. Actually, that was a great “excuse” when they were younger. But now that they’re grown adults, I’ve given up making my own! THIS I shall try!! I love this tutorial and enjoy reading your blog. The photos and ideas are inspiring. However, it is often difficult as all of the ads slow things down immensely. this is the bow my mom taught me many, many years ago…but I love your finish with the large loop at the end that you cut into the french ends. Hello! I love this bow! But I also love the ribbon. I know this is an old post but do you mind sharing where it’s from? Thanks so much! Thanks for the info, Shelby! 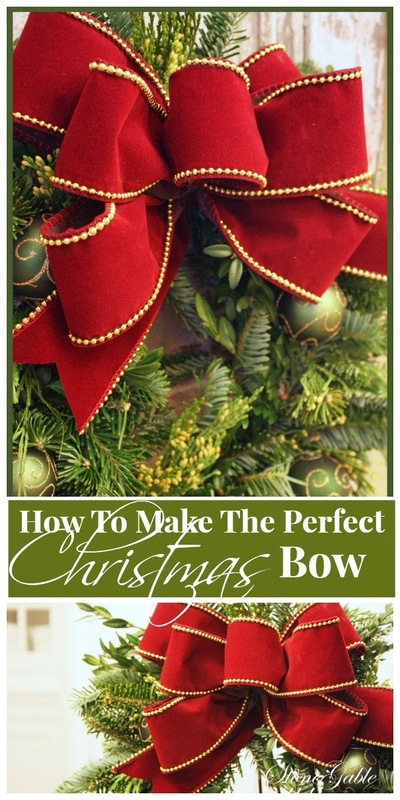 Just want you to know I remembered this post yesterday and came back to it to fix my bow making technique on a dining room table arrangement. Needless to say, it was spot on and saved me both time, and ribbon. Finally figured out what I was doing wrong! Thanks for sharing. Thank you so much for the tutorial mind turned out beautiful. I love this bow Yvonne. Thank you for sharing. I wonder if there is any chance you can move one step further to perfection by learning and posting a video of your bow making. I have seen a few bloggers who took that as a challenge to add something more to their blogs. This bow would be something I feel needs a physical example for a “how to”. Love your blog and all you do. Please don’t take this as any criticism…..only take it as a suggestion from someone who can’t figure out how to make your bow and would love a physical tutorial. Thanks bunches. Great tutorial, I learned what I needed to learn, & it was quick and easy! I like the way you do the ends of your bow! I’ve always seen where you start out making your first ‘tail’ just before the first loop. Mine have never looked quite right. Thanks for a perfect step-by-step! You are so talented Yvonne! 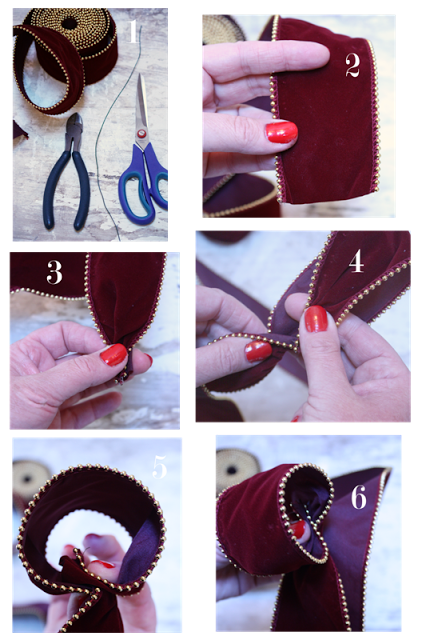 Thank-you so much for the tutorial, I am going to pin it and try it too! Great tutorial! Your bows are beautiful. Will definitely try this! I love your bows. I make bows too…a little differently. I definitely want to try your way. I have made a few this year…this tutorial makes the steps very clear! Love your full, poofy bows!!! 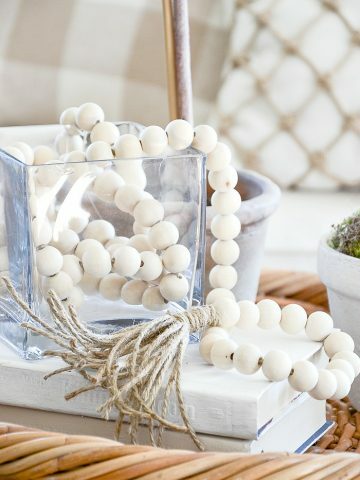 I’ll try this next time I make one! geesh, this keyboard is gonna make me crazy….sorry. Thank you so much Yvonne I am always doing ribbons by trial & error. Yours are done beautifully! Great tutorial, Yvonne! I have always wanted to learn how to do the triple bow! I never could get it right…lol! I have never made one so . But with your instructions matter of barely minutes and you have product success.